Prime Minister Joseph Muscat addressing a political activity in Żabbar on Sunday. 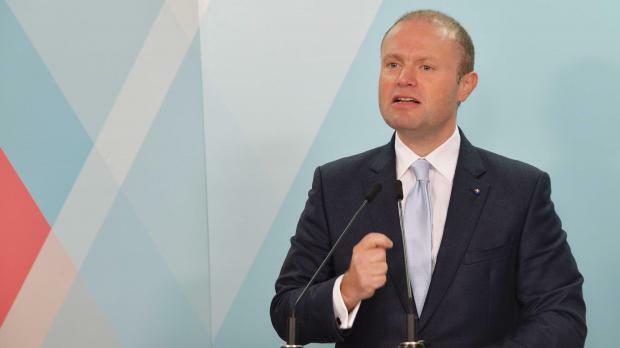 Prime Minister Joseph Muscat hit out at “extremes” on both sides of the migration issue, insisting again that Malta could not be expected to come up with a solution alone. Speaking at a political activity in Żabbar, Dr Muscat said Malta could neither listen to those calling for migrants to be left to drown at sea, nor to those who said anyone arriving by boat should be accepted into the country. “We have to be humanitarian and give help when it’s needed, but this is also a question of security; we cannot allow a free-for-all,” he said. The Prime Minister was speaking at the end of a week in which 49 migrants were brought into Malta, at the end of a 22-day ordeal which saw them stranded at sea on board rescue vessels as EU countries debated who should take them in. Dr Muscat, however, insisted that the migrants could have been taken back to Libya or onwards to Tunisia or Italy, the latter of which had refused entry, and that the problem “had nothing to do with Malta”. “We were clear with our European colleagues that we didn’t create the problem and the solution could not be solely ours,” he said, noting that the AFM had just days earlier rescued 250 other migrants in imminent danger. Dr Muscat said Europe had to show moral leadership and could not close its eyes to a humanitarian situation, but could not allow any and all to enter without consequence. He insisted the current situation was untenable and that a “sensible” EU-wide position was urgently needed. He said the situation was evidence that the Labour Party was the only one capable of leading the country. In a statement reacting to Dr Muscat's speech, the Nationalist Party dismissed his talk of aspiring to make Malta one of the world's top 10 democracies. "If he really wants that, he should ensure institutions are no longer controlled by his government. He should see to it that the Attorney General and police commissioner are not there to obey orders they receive," the PN said. The party also reiterated its calls to receive a copy of the Egrant inquiry.